Apple became the first company to surpass the $1 Trillion market cap today, but they have no place in Trump’s mantra of “Making America Great Again”. Even Apple’s sales appear almost immune to tariffs from China or the US. In promising to bring back US Manufacturing jobs, our President’s messaging heaps an inordinate focus on Steel as the traditional face of our halcyon industrial glory days. 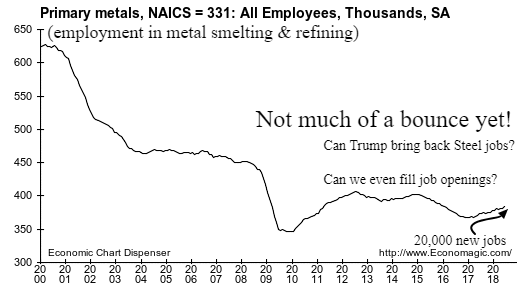 The image of blast furnaces smelting ore for Steel and other primary metals only represent 3% of manufacturing employment today. Huge corporate tax cuts and threats of tariff protectionism have accelerated job growth in the US and have even triggered a new hiring wave in Steel, but only modestly thus far. Factories are hiring and have record unfilled job openings with fewer prospects if the economy keeps growing at virtually full employment levels. China Trade uncertainty and finding people to work are the biggest complaints by businesses. Ironically, the strong economy and lack of available workers are sending jobs across the border to meet production demands, despite increased Trumpian tariffs threats. Automation, external job training and increased supply of educated immigrants are the only viable solutions during this new economic growth cycle and all of which will take years to acquire. Outside of the tiny Steel industry, manufacturing jobs created in 2017 expanded the most in almost a decade. Factory employment is on pace in 2018 to surpass any annual employment gains since 1997. Goods producing and industrial jobs are growing more rapidly since Trump was elected. The 300,000 manufacturing jobs already created under Trump plus the 900,000 since 2010 is a nice rebound for the factory sector. It’s the longest and strongest job growth period since the 1960’s. However, the big picture is that a return to the 1960’s or 1990’s level of industrial employment adding another 5 to 7 Million factory workers is virtually impossible over the next couple of decades given the growing dominance of tech and services. Another irony for Trump’s making America greater theme is his demand for a cheap dollar and pricier Yuan to foster US exports, while his stronger economy is sending US interest rates and the Dollar higher. Trump’s threats against China are also triggering a fall in China’s currency, making their exports cheaper. It’s too early to judge the trade efforts, but a trade agreement should add fuel to the the US and global economy by removing a significant layer of uncertainty. 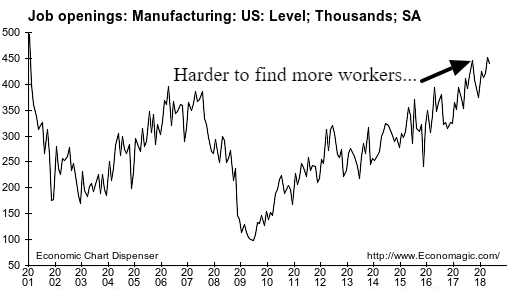 There is plenty of hyperbole over the return of manufacturing jobs. Workers are coming back, but not to the levels of past decades. While factory jobs are far from their golden days, industrial production is growing faster that the head count and within a couple percent of the record output levels of 2007. Our personal experience in manufacturing has been a doubling of sales with half the labor force over the past 20 years. This isn’t social foible to lament as advanced technology pervades our most basic levels of manufacturing. The good news for millennial’s today is that jobs are as plentiful as ever in many sectors inside of and outside the manufacturing space.